Is This Your Time to Join a SheLoves Circle? This is your invitation to join a SheLoves Circle. We have been planning, praying, training leaders and waiting for this day. Are you longing for a place where you can belong and be your full and honest self? Are you longing for a space that is not religious, but centers Jesus, Holy Spirit and Creator God, as you connect deeply with other women? Are you longing for a space where you can talk about Jesus, justice and living your juiciest life? Are you longing for sisterhood and community? SheLoves Circles are sacred spaces. They represent equality, wholeness and sisterhood. What is a SheLoves Circle? SheLoves Circles are vibrant, small-scale expressions of the SheLoves community. SheLoves Circles are communities of practice to work out our faith, along with our values of sisterhood, as we seek to become informed, empowered and transformed. 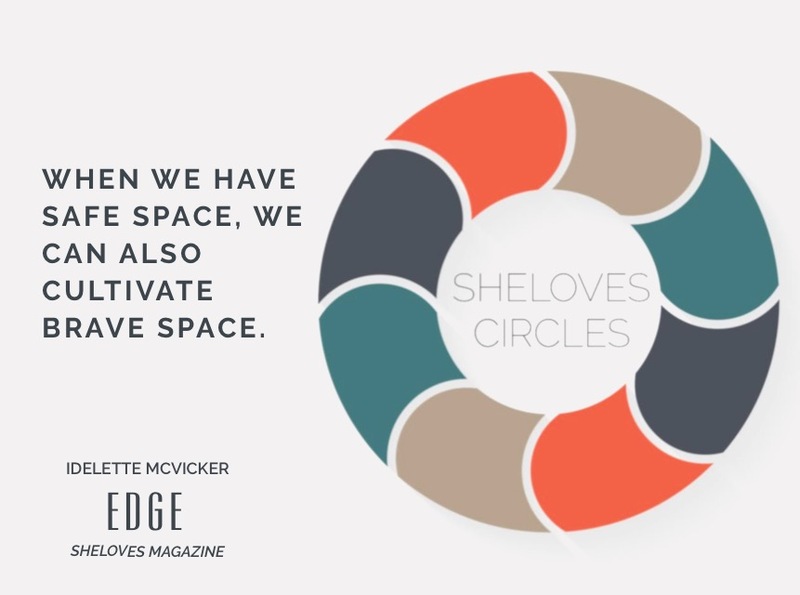 SheLoves Circles are places to pray, and spaces for deep, generative conversations where we build restorative connections. Story: A SheLoves circle is a place where we respect and value everyone’s personal story and create a safe space to share and discover it for ourselves. Safe + Brave Space: A SheLoves circle is a safe place where we can practice our voice and get strong. We honor the integrity of each circle, we don’t share details outside the circle and we don’t offer advice, unless asked. We follow the example of Parker Palmer of: No fixing, no saving, no advising, no correcting. We also call circles a brave space, because sometimes our growth doesn’t feel so comfortable. Even joining a group for you might feel brave today. When we have safe space, we can also cultivate brave space. Ubuntu: We understand that we as human beings belong to each other. Our thriving is connected to each other and to the thriving of our larger world. We move in relationship, connected to God, connected to each other. Spirit-led: We seek to love God, self and neighbor, in the power of the Holy Spirit, to the best of our ability and understanding. We believe in the Bible as the Word of God. It is a lamp unto our feet. The women of SheLoves are justice-seekers. We practice everyday peacemaking. We long for freedom and transformation, both in ourselves and in our world. When in doubt? Let Us Be Women Who Love is a guideline for how we want to live out our Love in this world. Circles will meet once a month, either in person or online. Each Circle will have a leader who has walked alongside SheLoves and holds the heart and vision of SheLoves. However, as women in the Circle rise, other participants may also take turns leading the monthly gatherings. Each Circle will develop rhythms that meet the needs of each group. Do I need to live in a certain geographic area to join? The beauty of a virtual community is that we are opening up several circles that will meet in the comfort of your home, from your computer or device. Choose a circle that meets at a time or in a time zone that works for you. This is Phase I of launching our circles, so we are starting with a few groups. As more leaders rise and get trained, we can open more circles. There are also circles that will meet in person. Our original SheLoves circle has been meeting in living rooms for nearly 10 years. Do SheLoves Circles cost money? SheLoves Circles are free and welcoming spaces to anyone who wants to join and agrees to respect and honor our values. We believe in the value and power of meeting together, as instructed by the Bible. We see online spaces as an opportunity for sacred community, not to replace local community, but to strengthen the Body of Christ, in every way we can. As SheLoves, we have practiced sacred community online for the past several years—first through our monthly editorial meetings and for the past year, through the Dangerous Women community. We have noticed that many women, by virtue of geography, accessibility or timing constraints, need access to safe and brave sisterhood space online. Interested in joining a Circle? Click here to sign up. There is limited space right now. There are currently three online circles available and two in person ones. We are limiting space to eight persons per circle plus a leader. As there’s demand and as leaders get trained, more circles will open up. So, please let us know your preference and hope. I really hope you will join us. We long for women to follow Jesus, become strong, rooted in faith, connected in community and released to live out our most beautiful life. Have more questions? Ask in the comments and I’ll be sure to respond. I know we couldn’t have done it without Kathleen who has been taking the lead and laying the tracks for Circles. All the Circle Leaders who have put up their hand—THANK YOU. ALL the local SheLoves group members have shown me that a long faithfulness is beautiful, possible and POWERFUL. You have taught me so many lessons. From the first women who showed up on my couch, to the current members who keep the Love alive. I love love love you. Rose who has stepped up to lead the local group and released me to now train up leaders for more groups. Our SheLoves editors who have shown me that virtual community is real and sacred. Every Dangerous Woman who believes in this community and gives me strength. Every other team member who remind me daily why we do this—Shaley, Chervelle, Courtney, Nichole, Brenda. Every friend who voxes and texts and encourages me and folds me into your lives. I am so grateful for your Love and wisdom. Sisterhood gives me the courage to step out. I long for every woman to experience this kind of sisterhood and I believe it is possible.